Chrysanthemums are usually associated with the Autumn season in the northern hemisphere, but the living flowers actually have no season. Spoon mums are a beautiful example of this kind of flower. 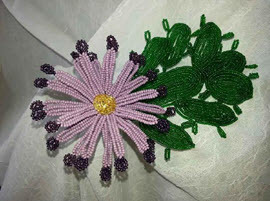 This pattern is unique in that it utilizes Size 10 and Size 11 beads, both opaque and transparent.